I’ve got vintage music style on my mind this week: first, Janis Joplin, then Debbie Harry. 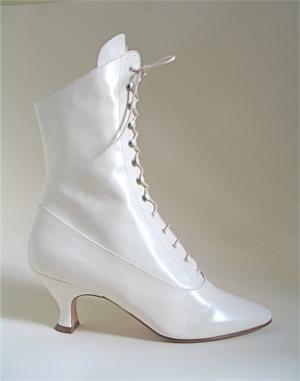 Now, the lace-up booties and mid-calf granny boots I’m seeing are reminding me of Madonna’s 1985 footwear. Madonna's shoes. Click for full photo by Ebet Roberts. Madonna's shoes. Click for full photo by Dave Hogan. Barneys has a cut-out style by L’Wren Scott that’s a higher-heeled, gray version of the black Peter Fox booties I had in ’85. Click to buy at Barneys. I don’t know if Madonna wore Peter Fox shoes but I wouldn’t be surprised if she had — why else would I have been so desperate for a pair of my own? My feet grew a little after I got the Peter Fox shoes so I gave them away a few years ago. I regret doing that without trying to get them stretched first. I have fond memories of how they looked with my black rubber Maripolitan bangles and heart-locket Borderline earring. At least I have a not-quite-as-vintage pair of Prada lace-ups to fall back on. Considering my devotion to Madonna, I’m amazed I never got her rhinestone boots from Desperately Seeking Susan. Madonna ogles the movie boots. Click for photo source. The boots play a key part in the movie. Cool downtown girl Susan (Madonna) is so entranced by the sight of the boots in the window of the (now-closed) Love Saves the Day that she trades her pyramid jacket for them. Bored New Jersey housewife Roberta (Rosanna Arquette) gets the jacket and is mistaken for Susan. Hipster hilarity ensues while Madonna wears the boots rolled down. The $49.99 version was pre-rolled. Why didn’t I get those? I will have to console myself with the ’80s studded boots that my gorgeous mother BarbaraB turned over to me. I featured these in my post on why criticism of fashion is sexist. Click! Meanwhile, if you’d like a pair of Victorian-style lace-ups — all the better to channel 1985 Madonna (and me) — you can still get them from Peter Fox. Click to buy at Peter Fox. Ahhhh! The first pair of shoes I had a fashion crisis over were lace up Madonna booties when I was in the 3rd grade! My best friend Angie came to school wearing a pair. She must have had a fit for her mom to let her leave the house in them. She let me wear them at recess and I was in love. I had never felt such shoe lust before! Only problem, Angie got them at a thrift store. I begged and begged my mom for a pair. God bless her for humoring me, she took me to every shoe store in the area but no one had them! I was devastated. So glad you did this post. Madonna’s shoes moved my little 8 year old soul. Love this memory! Thanks for sharing. Sometimes I miss how desperately I wanted things at that age! I’ve never been a fan of the granny boot. They are too witchy for someone who wears a lot of black. But you make a great case for them. And it is October. So there is no such thing as too witchy. Excellent point on witchiness. Let’s witch out to the max this month. I remember when I girst saw this film, it was too soon after the 80s to be cool, and I thought the boots were awful, Rosanna Arquette’s leather jacket was awful, the hair was awful… and now I love all of it and would SO give up my leather jacket for a pair of spiky diamond studded boots. Vintage seems to be at the top of everyone’s style list lately so even though they might have looked ‘granny’ and ‘witchy’, they will look really stylish now! I have lusted after Desperately Seeking Susan’s boots since I was ten years old. I can’t believe I’ve never seen “Desperately Seeking Susan.” Gotta get that in the Netflix queue. Your new-to-you boots are totally hot. Lucky you to share a shoe size with your stylish mom! First time commenter, but oft lurker here. I love your blog, Wendy! I covet your jewelry, and as a hobby-only jewelry designer, I really appreciate the information you give us on the production process and all. Peter Fox as in, Fox and Fluevog Peter Fox? Given the name, and looking through the designs, I’m thinking so. Awesome. Yep! That’s the very one. They went their separate ways in 1980. Glad you were inspired to comment! 25 years ago … Desperately Seeking Susan. Love Peter Fox forever boots. Great show and tell here. I LOVE this movie…it’s ’80s Madonna at her best. I never got the boots, but I rocked rolled up boxers at the beach as my cover up. In the ’80s, when I was a teen, of course. I had red granny boots like those white ones, with black laces, in 1984. God, I loved those so much. I later dyed them purple. I wish I’d kept them! I love those Barney’s boots. The holes are great because you can wear funky tights with them and they will show through. Miss J had the most AWESOME bluish gray lace-up granny boots in the 80s. She wore them EVERYWHERE. I’ve always loved the Victorian lace up style bootie for some reason. Have you check out Boardwalk Empire on HBO? This past Sunday had a close up of one of the characters putting on some fancy booties. I had black granny boots. I wore them with a black leather pencil skirt and a white non-tuckable blouse to channel Catherine Deneuve in “The Hunger.” Loved! Love those Madonna boots, shiny…shiny! Madonna’s lace-up boot look was the look that saved me from the “I-want-to-wear-a-skirt-but-I-can’t-find-acceptable-shoes” dilemma in the ’80s. Once I found a pair of those boots, it was skirts all the way. I had pair after pair for years, waaaaaaaaaaay past the point where they went out of style. The utilitarian look was so appealing, I just kept it going. you and madonna can rock those boots however i would look like a witch looking for her broom…:( sad times. how are you luv? We need to have a girls movie night — Desperately Seeking Susan. Have you been secretly surveilling me? I just tossed out a pair of those from the late 70’s that were beyond repair! Gosh, love my witch boots and I had various incarnations from Victorian (found brand new at a rummage sale in the 70’s — ah those were the days…) to a platform style I still have, to my recent red clunkers! They’re a great classic. Love those boots from your mum, great style def runs In your family! ok so the peter fox boots are almost identical to my often mention long lost victorian style boots that no one seemed to “get” back in 1995. I love those Susan boots and I’ve always been a fan of those Victorian boots style. I want some in brown! well i am all for a bit of blondie and janis joplin! fab stuff! and it is crazy how much madonna-reminiscent fashion is on the scene right now. kind of mind boggling! I love those last ones, the black. 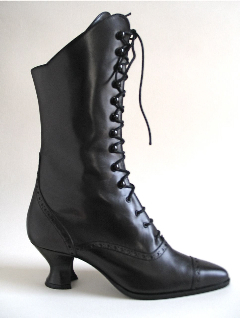 Am on the lookout for a good pair of Victorian-style lace up boots. I am totally having boot overload after this post! If only I could afford the L’Wren boots! The boots from your mom are amazing, too. I wish I shared a shoe size with my mom. Ok I have to admit that I was actually searching for something else when I found this post – but at the same time have to say these shoes rock! Pretty impressive collection really. Just look at that fabulous white boot! I want one right now, so I can play Snow Queen or something in the coming Halloween Party! It’s such a wicked shoe, tantalizing me with its sleekness..
OMgosh Wendy….I missed this post when you first posted it; I love love love these boots! I actually wore Victorian style lace up boots for our wedding in 1994. I will own a pink pair someday and wear them with pride !!!! Love that you wore yours for your wedding!